Click here to book from a selection of Calgary hotels. What used to be a wide expanse of farming and ranching country is now the modern cosmopolitan city of Calgary, Alberta. Residents of Calgary enjoy the best of both worlds: the foothills and Rocky Mountains on one side, open prairies on the other, and a vibrant city life to balance it all off. Stay in a Calgary, Alberta hotel or Bed and Breakfast, and be right at the center of all the activity! Calgary is nearest big city to Banff in the Canadian Rockies. Make sure to leave time to head to Banff, which is about 1 hour from Calgary. If staying in the Calgary area, get on your cowboy boots and explore the surrounding area of Western-style communities such as Bragg Creek, Cochrane and Okotoks, with activities such as fishing, horseback riding, ranching, and farming. These communities share their lifestyle and history with visitors through museums such as the interactive Western Heritage Center in Cochrane where the history of ranching in the region is displayed, and visitors observe calf-roping, branding and sheep shearing. The immensely popular Calgary Stampede is the event of the year, where 173 acres are filled with visitors enjoying shows, chuck wagon racing, games, rodeo activities, shopping, and a midway. Patrons dress in western garb and eat pancake breakfasts in the street before heading off for some good 'ole country fun. If you're not a cowboy at heart, you will still be impressed with the exciting urban life that Calgary boasts. What used to be a ranching and meat-packing based economy is now a corporate headquarters for the many oil and telecommunications companies that are based in Calgary. This boom in the economy has made Calgary one of Canada's fastest growing cities; in fact, Calgary has been Canada's fastest growing economic region for seven of the last 10 years. Go shopping at Eau Claire Market, check out the Calgary Zoo (Canada's second largest), or the famous Calaway Park (Canada's largest outdoor amusement park). Calgary has its own symphony orchestra and opera company. 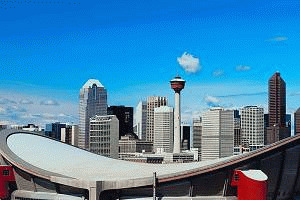 Book Calgary Alberta accommodations and see what the buzz is about! Our suite is near the Calgary Tower, and the Core Shopping Centre. We provide Free Wi-Fi. We also have a fully equipped kitchen, a living room that features a flat-screen cable TV and large windows that give a beautiful view of the city. A private balcony is included. Our suite also offers a dining area and a work desk. We provide a non-smoking environment for our guests. Our beautiful Calgary hotel is located near the University of Calgary. Our hotel features a fitness centre, and business center for our guests to use. Free Wi-Fi and breakfast are provided. There is a microwave, refrigerator, desk, and a flat-screen TV provided in each of the rooms. There is also coffee-making facilities and air-conditioning. We have a 24-hour reception offered at our hotel. Our south Calgary hotel has state-of-the-art fitness facility boasting cardiovascular equipment, free weights and more. Swim in the indoor swimming pool and have fun going down the 40-metre waterslide. Pet friendly: we allow small- to medium-sized cats and dogs to stay with you. Guests have access to our Club Floor Lounge, featuring evening appetizers, locally craft brewed draught beer and more. Discover this hotel located near Calgary International Airport and just a short drive from the hustle and bustle of downtown. Designed with you in mind, our spacious guest room suites, featuring full kitchenettes are ideal for extended stay travelers. Energize in a smarter space, and enjoy our clean design, natural light, and fast & free WiFi. This Calgary Hotel (3 km from the airport) embodies the feel of luxury with a contemporary look and savvy architecture. We offer a complimentary full breakfast and complimentary shuttle service to and from the airport with your stay. We are 100-percent non-smoking. Each room features an in-room safe, 42-inch television, free Internet access, a clock with MP3 input, and pillow top beds. Centered in the heart of downtown Calgary, steps from the cultural, recreational and business areas of the city, this all-suites Calgary hotel features first-class amenities, unrivaled services and spacious accommodations. Relax with a massage from the spa, plan the day with help from the knowledgeable concierge services or watch a movie on in-room flat-screen TVs. 1947 - 18th Avenue N.E. Our Calgary accommodation is only 10 minutes from the Airport and only 7 minutes from the heart of downtown Calgary, making us a great choice for a Calgary airport hotel. Shopping and other attractions can also be easily accessed from our location. We also offer an indoor swimming pool, exercise facilities, and an on-site restaurant! Our central location is within minutes to the Calgary Airport and downtown. We are famous for the mouth-watering, breakfast buffet dished up daily for a nominal fee, featuring sizzling bacon, fresh prepared waffles and eggs, there's no better way to start your day. Book your fresh, clean, spacious oversized room for the best location and value! Our beautiful Calgary resort is located near the Heritage Park Historical Village. We provide Free Wi-Fi and a Flat-screen TV in all of our guest rooms. There is a coffee machine and desk provided with a private bathroom with free toiletries. Select rooms include a minibar. There is an indoor & outdoor hot tub available for use along with a fitness centre. A restaurant and bar are located on site. Our pet friendly Calgary hotel is just minutes from Calgary International Airport. Enjoy free airport shuttle service, free WiFi, and a free Daybreak continental breakfast. Each of our rooms comes with a microwave and refrigerator. Enjoy our indoor pool, hot tub, and fitness center. Take advantage of our guest laundry facilities and outdoor plug-ins for your vehicle. This Calgary hotel features an indoor pool with hot tub, on-site dining and guest rooms with free Wi-Fi. A flat-screen cable TV and coffee-making facilities are provided in all rooms. A work desk is included in the rooms. Casual dining is available at The Bistro which offers breakfast, lunch and dinner. A fitness centre is on site. The hotel is 20 minutes from the Calgary international airport. Our Calgary Airport Hotel amenities include free airport shuttle, free wired and wireless high-speed Internet access, business center, and guest laundry. Our complimentary Express Start Breakfast Bar is served every morning featuring the world's best tasting cinnamon roll. Watch for our indoor pool, water slide, hot tub and fitness center opening Spring 2008! Centro is the first boutique motel in Calgary, and offers modern, stylish rooms at affordable rates! Included in every room is free wireless internet, free North American-wide calling, free parking and free breakfast. Relax in the internet cafe in the lobby and catch up on the latest news or check our email on the state of the art computers, complimentary for guests to use. Our hotel is right next to the Calgary International Airport. We provide our guests with a non-smoking environment. We offer Free Wi-Fi, and a nice hot breakfast. Each suite has a kitchenette, and an en suite bathroom with free toiletries. We also have a fitness centre available along with an indoor pool and hot tub. There is a market onsite and a free grocery shopping service is offered. Welcome to Calgary’s newest full-service Airport hotel with breathtaking views of the Rocky Mountains and the Calgary city landscape. This property is ideally located only 3 kilometers from the Calgary International Airport with free 24 hour shuttle service and easy access to the major arteries of both Deerfoot Trail and Stoney Trail. Guests are only minutes away from heading into downtown. Our beautiful Calgary suite offers free Wi-Fi and a completely furnished apartment including a TV, air-conditioning and a balcony to enjoy the view. There is a full kitchen, with a dishwasher and microwave. There is also a private bathroom. Guests can enjoy an on-site fitness centre. We also offer laundry facilities, and free on-site parking for guests to use. We are in the heart of downtown Calgary. Our all-suite, four-diamond hotel is surrounded by Calgary's most exciting shopping and recreation areas. Visit neighbouring attractions, including the Eau Claire Market and Prince's Island Park - an extensive parkland which plays host to a multitude of Calgary festivals.